Welcome to the Gates of the Arctic National Park Information. The closest major airport is Fairbanks, located about 200 miles southeast of the park. Local airlines fly into Anaktuvuk Pass, Bettles, and Coldfoot, Alaska. There are no roads in the park, although the Dalton Highway comes within about 5 miles of the park’s eastern boundary. Other than hiking in from the Dalton Highway, between approximately milepost 190 to milepost 276, access is generally by air. Scheduled air taxis from Fairbanks serve Anaktuvuk Pass, Bettles, and Coldfoot. Charter flights may be arranged. Contact Bettles Ranger Station for the list of licensed air taxi operators. Drive south on the Dalton Highway (Stateroad 11) to the Coldfoot Ranger Station. Drive north on or to the Dalton Highway (Stateroad 11) to the Coldfoot Ranger Station. 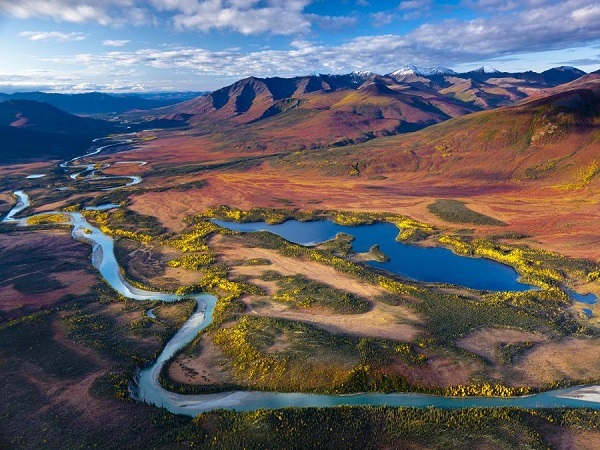 By establishing Gates of the Arctic National Park & Preserve in Alaska’s Brooks Range, Congress has reserved a vast and essentially untouched area of superlative natural beauty and exceptional scientific value – a maze of glaciated valleys and gaunt, rugged mountains covered with boreal forest and arctic tundra vegetation, cut by wild rivers, and inhabited by far-ranging populations of caribou, Dall sheep, wolves, and bears (barren-ground grizzlies and black bears). Congress recognized that a special value of the Park and Preserve is its wild and undeveloped character, and the opportunities it affords for solitude, wilderness travel, and adventure. Gates of the Arctic encompasses several congressionally recognized elements, including the national park, national preserve, wilderness, six Wild Rivers and two National Natural Landmarks. The National Park Service is entrusted to manage this area to protect its physical resources and to maintain the intangible qualities of the wilderness and the opportunity it provides for people to learn and renew its values. The entire Noatak River drainage, of which the headwaters are in Gates of the arctic is internationally recognized as a biosphere reserve in the United Nation’s “Man in the Biosphere” program. Although a number of studies have been conducted within Gates of the Arctic National Park and Preserve, the extent and character of the cultural resources within the park are not yet fully known. The archeological investigations undertaken within the park and preserve have produced a basic outline of prehistory, but only a small fraction area has been studied. Similarly, a systematic inventory of the historic sites within the park has only recently begun. Additionally, intangible cultural resources, notably the oral histories of past human use of park lands, are being assembled and recorded. Administrative buildings in Anaktuvuk Pass, Coldfoot, Bettles and Fairbanks are accessible. Gates of the Arctic is a remote wilderness, and travelers should be fully competent in outdoor survival skills and flexible enough to deal with common weather delays. Visitors are reminded there are no facilities within Gates of the Arctic National Park and Preserve and they should be fully self-sufficient and flexible at all times. There are no roads or established trails within the Gates of the Arctic National Park and Preserve. Hikers should practice Leave No Trace techniques, be aware of backcountry safety guidelines, and remain aware of the fragile ecosystems and private lands within the park. Gates of the Arctic is one of several conservation units located in the Brooks Range. Many of these units were established for wilderness recreation activities such as: backpacking, river running, mountaineering, dog mushing, and others. The remote location and extreme climate of the Brooks Range requires travelers to have strong wilderness skills and flexibility to adjust plans. The Dalton Highway offers a road accessible Brooks Range experience for those not prepared for a rugged wilderness journey. Visitors are strongly encouraged to practice minimum impact/ leave no trace camping guidelines at all times. Fires should be used only when regulations permit and if possible, kept on river bars below the high water line. Visitors are reminded there are no facilities within the preserve and they should be self-sufficient at all times. The Brooks Range is home to both black bears and grizzly bears. Black bears primarily inhabit the forested areas of the park, grizzly bears live mainly on the open tundra, but may be encountered in all areas of the park. There are no campgrounds in the park although there is a campground managed by BLM at Dalton Highway Milepost 180 (5 miles north of Coldfoot). The campground is open from June through mid-September. It is the responsibility of the visitor to obtain all of the necessary information and avoid private property. Fishing is permitted in both Park and Preserve with a valid Alaska State Fishing License. Applicable sportfishing regulations can be found in the Alaska state fishing booklets where licenses are sold. The Park encourages catch and release fishing as a means of preserving the diversity and numbers of species. Short growing seasons and long winters mean slow growth for many of the fish found in the Brooks Range. Fisherman are encouraged to use barbless hooks and be familiar with proper releasing techniques. For a pamhlet on these techniques please contact the Visitor Use Assistant at the Bettles Ranger Station. Be sure to indicate which type of fish you are seeking. Supplies are generally not available within the Park. Visitors must plan to be self-sufficient. There are no roads or established trails within the Gates of the Arctic National Park and Preserve. Hikers should practice Leave No Trace techniques, be aware of backcountry safety guidelines and remain aware of the fragile ecosystems and private land. A valid state license is required to hunt, fish, or trap on any Gates of the Arctic lands. All such activity must be done in accordance with state and federal laws. There is no commercial lodging in the park. The park has a required backcountry orientation program for all recreational travelers. The backcountry orientation will be offered at the: Bettles Ranger Station, Coldfoot Visitor Center, and Anaktuvuk Pass Ranger Station. Backcountry users not passing through one of these locations should call the Bettles Ranger Station. The Coldfoot Visitor Center offers evening programs during the summer. While in Coldfoot check out the ruins and cemetery of “Old Coldfoot” or visit the historic village of Wiseman just 13 miles up the road. The Anaktuvuk Pass Ranger Station, Bettles Ranger Station, and Coldfoot Visitor Center have backcountry orientation displays. Bettles Ranger Station has an interactive CD-ROM program on site. The Coldfoot Visitor Center has scheduled evening programs during the summer. The central Brooks Range has long severe winters and relatively short cool summers. The entire region receives continuous sunlight during the summer for at least 30 days. The south side of the Brooks Range below 2,500 feet is generally a subarctic climate zone. Precipitation is low, averaging 12 to 18 inches in the west and 8 to 12 inches in the east. Snow falls 8 or 9 months of the year, averaging 60 to 80 inches. The average maximum and minimum July temperatures are 70 F and 46 F, respectively. Average maximum and minimum January temperatures are -10 F and -30 F. Thunderstorm activity is common during June and July, and generally June through September is the wettest time of Year. Prevailing winds are out of the north. The north side of the Brooks Range has an arctic climate. Mean annual temperatures are colder than on the south side. Maximum and minimum February temperatures range from 33 F to -47 F. The warmest month, July, has 60 F maximum and 40 F minimum. Precipitation is extremely light, about 5 to 10 inches a year, making this essentially an “arctic desert.” Snow has been recorded in every month of the year, and the annual average is 45 inches. Prevailing winds from the east in summer and west in winter are greatly modified by local terrain.